Mr. Leight wears different frames for various occasions and rotates between four to six pairs. 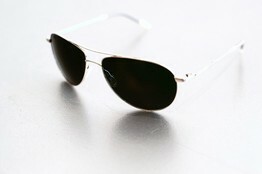 Generally, he prefers a metal-framed aviator, which he says is versatile and can be flattering to many face shapes. 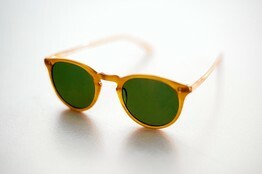 The aviator styles he prefers have “a slight edge” to them, says Mr. Leight. He wears his brand’s Aero style during his workday and the slightly curved, more casual Benedict style on the weekends. The frames are made of lightweight titanium alloy. How the frames fit and flatter his face are key considerations. Because most people shop for sunglasses infrequently, they don’t know how a frame should sit on the face, he says. “You have to know your face shape, nose, eyebrows,” he says, adding that knowledgeable sales staff can be a huge help. “You have to have a real [understanding], like when you’re heavy and you don’t wear horizontal stripes.” Those with long chins, for instance, look best in upswept or butterfly-shaped lenses that draw the eyes upward, he says. Overly chunky sunglasses can add unnecessary weight to a chubby face. It’s best to stick to thinner rectangular frames if you want your face to appear less round, he says. When Mr. Leight finds a pair he likes, he checks for comfort around the nose bridge and for tips that fit over his ears. He wants the frame to fit snugly, without too much “general tightness” near his temples and ears. Also, sunglasses shouldn’t slip down from the nose, he says. Sometimes nose pads can help keep frames in place. “You don’t want to keep pushing it back up,” says Mr. Leight. If he’s not sure about a frame, he sometimes wears it around the city to hear the reactions of friends or acquaintances before making a final decision. He wants frames that make a statement—but makes sure that people’s reactions aren’t too shocked.